In Korean, the word “bom” has several different meanings depending on the context in a sentence. 3. the act of seeing. to experience. to feel (touch) with sight. It is all about how the photographer sees and captures each moment. We believe that every photograph must convey the emotion of that captured moment. We aim to create the most delightfully unique and creative images. 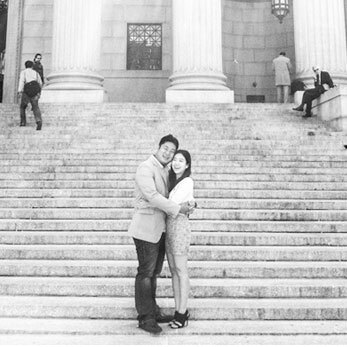 We are Paul and Sumee, a husband and wife New York wedding photographer team! When we’re not shooting weddings, we’re either cooking something we’ve never cooked before, planning a trip to a place we’ve never been to, discovering a foodie restaurant that hasn’t been found yet, or doing silly dance moves that we dare not show anyone else. :) We have two coffee machines at home but not a single chair with a backrest – only stools and benches. We like trying wines under $10 with funky labels and love the fact that most of them taste pretty darn good to us. We love vertical iPhone pictures that make you look slimmer and taller than you really are, like the picture to the left. We’d love to photograph the biggest day of your lives!